Thirteen FMJ Attorneys Named to 2018 Super Lawyers List | Fafinski Mark & Johnson, P.A. Congratulations to our “Super Lawyers” (Heidi Carpenter, Bob Fafinski, Kevin Johnson, Donald Chance Mark Jr., Shannon McDonough, Pat Rooney, David Runck, Pat Shriver, and Sharon Van Dyck, formerly of FMJ), as well as our “Rising Stars” (Nathan Brandenburg, Tyler Brimmer, Jenny Helling, and Matthew Jensen). Super Lawyers rates outstanding lawyers who have attained a high degree of peer recognition and professional achievement. The selection process includes independent research, peer nominations, and peer evaluations. 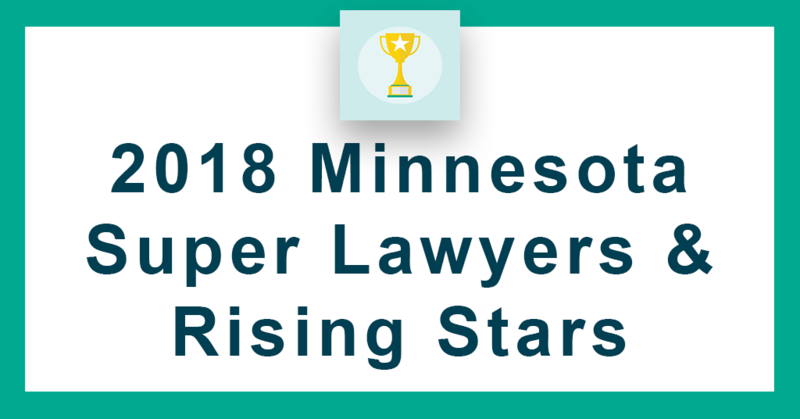 Up to 5 percent of the lawyers in a state are named to Super Lawyers, and no more than 2.5 percent are named to Rising Stars. Super Lawyers is a registered trademark of Thomson Reuters.